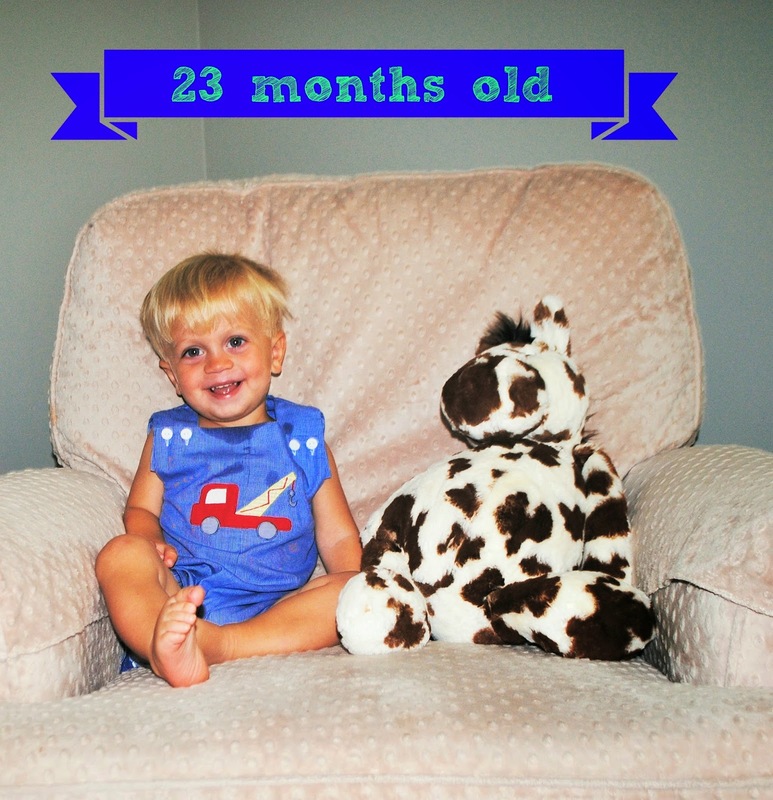 Moments with the Mays: Griffin is 23 months old! Griffin is 23 months old! Griffin is 22 months old! Griffin, you are 23 months old...only one month shy of turning TWO! How in the world is that even possible?! Clothing: 18m-24m...that's right! We have FINALLY moved on to some 24m things! I am so excited that he is now fitting into some of my favorite old Grayson outfits! -You LOVE going to the pool! We have been going just about every day & you are doing so good. You use the inflatable floaties & love to float on your back (with our help), kick your little legs, & jump off the side. You even have let us put you under the water! I am so impressed that you've turned into such a water baby this summer! -You continue to amaze us with how vocal you are. You are talking ALL THE TIME. From the time you wake up until the time you go to bed, that little mouth doesn't stop moving. You speak pretty clearly, too. I wish I could bottle up your sweet baby voice forever! -Music is your favorite. You love to sing songs all day! You can hear a song just a couple times and you will already learn the tune. That makes your music loving mama proud! Songs you love to sing are: Wheels on the Bus, The Firetruck Song, any of the KidSongs songs, & Let it Go. -You had your first taste of "school" this month with Playcation at church. You & Grayson had 3 days of VBS and you loved it! -You can count 1-4! You love to count your ducks in the tub & count before you jump in the pool. -You are learning lots of colors: purple, green, blue (your favorite), red, orange, yellow, & pink. -playing outside! You love to use your lawn mower & weed eater, dig in the mulch, ride in your Cozy Coupe and the Gator, and jump on the trampoline. -trucks, trucks, and more trucks. -animals. We currently have baby bunnies in our yard & you are so interested in them! You also LOVE your dogs and birds. You call birds, "Rios", after your favorite movie. I will be so sad when you stop saying that! -Fruit snacks. You live for those things!! -reading books. You would sit on the couch me in the bonus room & read all day if I let you! You love reading books! Griffin, I really can't believe that you will be 2 next month. I also can't believe you will be a BIG BROTHER in a little over a month! You may be turning into a big boy, but you are still my baby. You are so snuggly & are always giving out hugs! Your personality is so big & we adore your goofy little self! Happy 23 months, Griff!